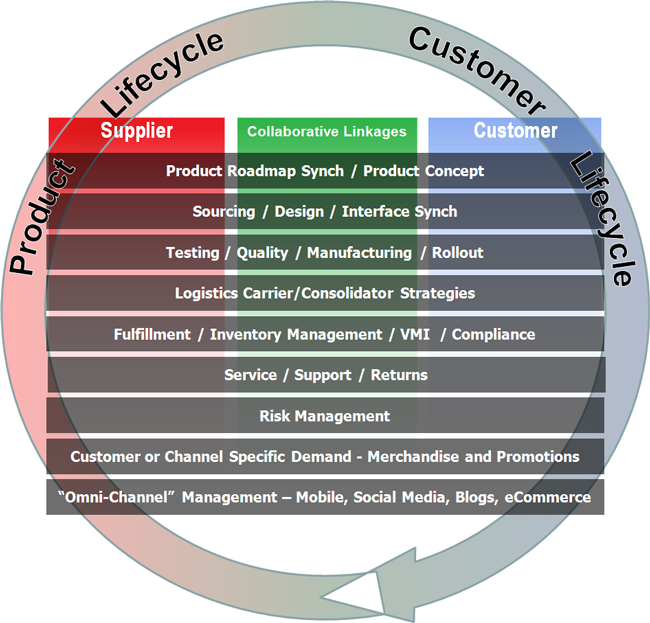 Much collaboration is needed to produce, deliver, and support products and services. This is the second in our three part series on collaboration. In Part One, we laid out a framework for viewing collaboration across the product and customer lifecycles (See Figure 1) and then described collaboration in the product conception and design phases. This article focuses on ‘operational collaboration’ that occurs as companies test, rollout, ramp up, and then deliver and fulfill demand for products and services. The handoff from engineering to testing, to manufacturing, and the ramp-up of production can be a challenge even when it is all done in the same location by one company. The problem is compounded in a multi-company, virtual enterprise. There can be many a slip ‘twixt the cup and the lip’ in this process, including manufacturability issues unforeseen during design. Fortunately, modern testing and manufacturing systems allow contract manufacturers and suppliers to share their test and production data, collected at remote sites. Then the real work of collaboration becomes the distributed team—which can include people from engineering, testing, quality control, and manufacturing in the different trading partner firms—working together to home in on the root cause of a problem and determine an affordable and timely resolution. Large companies and their ecosystems deal with an immensely complex and varied set of movements of components and finished products, not to mention returns, spares, and ancillary materials (e.g. packaging, shipping containers, etc.) There are large potential gains from logistics collaboration between all the players—for example, by optimizing packaging and packing and delivery sequences, or avoiding empty backhaul by coordinating the shippers’ inbound deliveries with receivers’ outbound shipments. VICS (Voluntary Inter-industry Commerce Standards) has an Empty Miles Service that attempts to solve this empty backhaul problem. For many people, supply chain collaboration is embodied by CPFR (Collaborative Planning Forecasting & Replenishment) and the sharing of demand information, creating a shared forecast and replenishment strategy between trading partners. CPFR was conceived over a decade and a half ago by Walmart and developed and promoted as a standard by VICS. Early adopters and pilots saw some pretty dramatic benefits in increased revenues, more accurate forecasts, reductions in inventory, and improvements in category management. In spite of these benefits, adoption has not been as widespread as initially hoped, in part due to competition for budget and resources from other supply chain initiatives, the large amount of effort required to collaborate deeply with many smaller trading partners, and challenges associated with large numbers of SKUs. 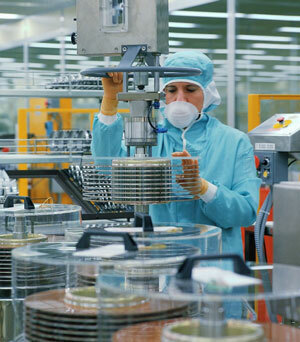 Another area with the potential for collaboration is VMI (Vendor Managed Inventory). Ideally the retailer or OEM shares enough information and gains enough confidence to let the supplier decide the ideal inventory levels. In practice, the retailer or OEM will often set the required inventory levels or, at least, the days/weeks of supply required. Retailers in particular, but also large customers in other industries, will publish a compliance manual for suppliers with precise specifications for labeling, packaging, packing and loading, routing guides . . . specifying virtually every aspect that impacts their ease of handling and efficiencies. A well run compliance program can be a competitive advantage. In part, good compliance is the result of strict enforcement and penalties. However, there is room for collaboration here too. Some customers invite suppliers to their facilities to show the suppliers directly how their actions physically impact the customer’s operations: for example showing a pile of goods that has to be manually handled because the auto-sorting machine couldn’t read the label. These types of direct face-to-face dialogs can include brainstorming of solutions that may lower the suppliers’, as well as the customers’ costs. Those savings can be shared, making it a win-win situation. In any case, letting suppliers see the consequences with their own eyes also can help improve compliance. 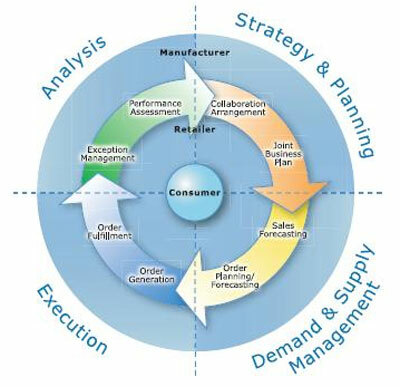 It is common for a company to maintain supplier scorecards to track and try to improve their supplier’s performance. This is important, but sometimes the customer’s actions are negatively impacting the supplier’s ability to perform. For example, a supplier’s on-time delivery may be low, but if the customer’s forecast accuracy is horrible and the forecast changes dramatically every week, the supplier’s job is extremely difficult. 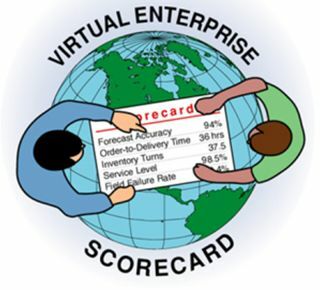 We have advocated a bi-directional ‘virtual enterprise scorecard’ that measures key behaviors and metrics on both sides of a relationship as a superior approach to improving performance. Often, suppliers need to be involved in providing end-customer service and support, whether helping to debug a problem involving their component, supplying spares inventory, or actually repairing their modules. 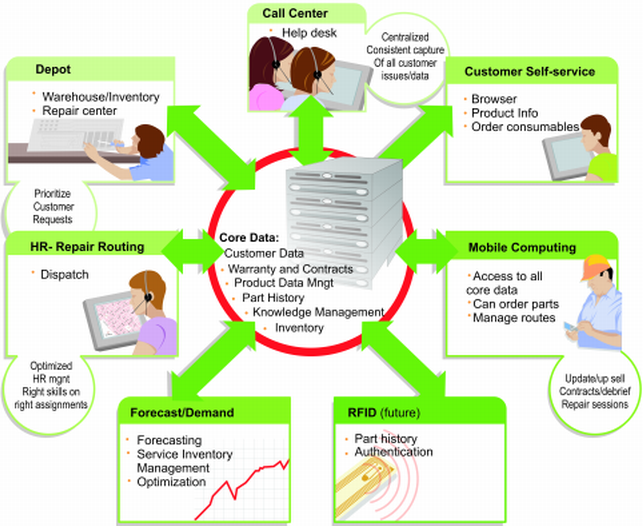 This requires collaboration and synchronization on many fronts (see Figure 3): for example, setting up the agreements, processes, and systems needed for a customer call center to bring supplier experts into the resolution process, whether on a joint call or hand-off or in the background. Or coordinating the delivery of parts and repairs onsite. Equally important, it is critical that information about field failures is shared with the appropriate suppliers so they can improve their designs and/or manufacturing processes (design for serviceability), preventing future failures, improving product reliability, increasing customer satisfaction, and lowering costs for all involved. In Part Three, the final article in this series, we focus on collaboration for managing risk, bringing the voice of the customer into the collaborative processes, and where we are going next—the latest trends in collaboration.